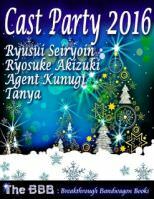 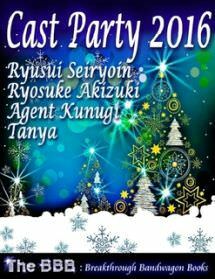 To commemorate the 4th Anniversary of The BBB, "Cast Party 2016" was held in December 2016. 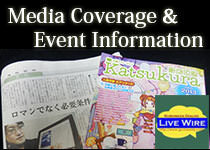 The special guest was Mr. Ryosuke Akizuki, the author incognito, who appeared in the media for the first time. 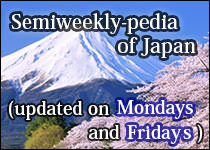 In 2016, more than ever, The BBB published amazingly memorable and impressive works. 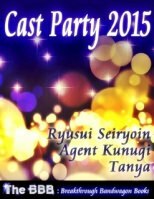 This session heated up more than it did in "Cast Party 2015". 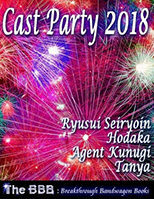 - Dr. MORI, Hiroshi's story collection "Seven Stories" and his masterpiece "The Sky Crawlers"
- The crossover possibility of "The Gifted"
- The hint of the breakthrough might be Pikotaro's "PPAP"
This Cast Party 2016 was exclusively held at the end of 2016 as one of the made-in-Japan contents belonging to The BBB: Breakthrough Bandwagon Books.